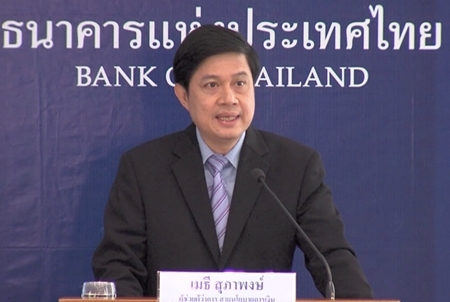 BANGKOK, 12 March 2015 – The Bank of Thailand’s (BOT) Monetary Policy Committee has reduced the benchmark interest rate by 0.25% to 1.75% per annum in response to the weaker-than-expected recovery of the Thai economy. BOT Assistant Governor for Monetary Policy Group Mathee Supapongse said on Wednesday the Monetary Policy Committee (MPC) voted 4 to 3 to cut the policy interest rate by 0.25%, effective immediately. The cut was made in response to lagging consumption, investment and private sector confidence observed in quarter four of 2014 and in January of 2015. According to Mr. Mathee, the four committee members who voted for the cut wanted to lower the benchmark rate to support the economic recovery and private sector confidence, while the three members who voted against considered the 2% per annum rate relaxed enough to promote economic recovery. Wednesday’s policy rate cut makes Thailand’s benchmark rate the lowest in the ASEAN bloc.